Two separate whistleblowers voluntarily provided original information to the U.S. Securities and Exchange Commission (“SEC”). Their information led to the successful enforcement of the same SEC whistleblower case. The SEC’s Claims Review Staff (“CRS”) issued a Preliminary Determination granting a joint SEC whistleblower reward. However, the CRS recommended that they receive different percentage amounts of that joint SEC whistleblower reward. Each of the whistleblowers sent their own written notices to the SEC stating that they were not going to contest the CRS’s Preliminary Determination. For the reasons set forth in the Preliminary Determination, the Commission entered an Order granting the joint SEC whistleblower reward, divided between them in separate individual amounts. The total 20% joint SEC whistleblower reward was apportioned between the two whistleblowers. 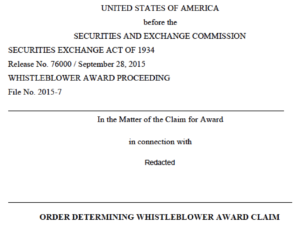 One whistleblower received eleven percent (11%) of the joint SEC whistleblower reward. The other whistleblower received an individual payout of of nine percent (9%). The Order did not give details about the facts of the case or about the assistance that each respective whistleblower provided to the SEC. Nor did it explain the reasons for the different percentages awarded to each whistleblower.